The 2018 Toyota Camry is available with either a 203 hp 2.5-liter inline-4 or 301 hp 3.5-liter V6 gasoline engine or a 208 hp combined output 2.5-liter hybrid. 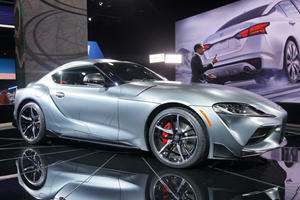 Drive is sent to the front wheels through an 8-speed automatic transmission or 8-speed auto/CVT in the hybrid. A renewed focus on a sharper drive mean that all versions perform well with the hybrid offering potentially excellent fuel economy. Notable standard safety features include Toyota Safety Sense-P which offers a comprehensive level of driver assistance systems such as adaptive cruise control and pedestrian and collision warnings. Totally redesigned for 2018, the Toyota Camry moves away from its solid but staid image and offers a sharp new exterior look and improved driving dynamics all while retaining its family friendly appeal. The interior of the Camry is as different compared to the outgoing model as that aggressively styled exterior. A large screen dominates the center console and the cabin material quality is good throughout. The Camry does not pretend to be an opulent luxury sedan but the seats are comfortable and the available options can make for a well-specced car. The 2018 Camry sits lower than before but so do the seats so headroom has not been compromised and there is ample space for both front and rear occupants. The trunk is large and cargo space is aided by folding rear seats. The biggest change for the new Camry other than the way it looks is the upgraded rear suspension and sharper steering feel which make for a far more connected driving feel. It will not be challenging European sport sedans for dynamic finesse but it elevates the previously staid handling feel and gives the car a more responsive feel on the road. Happily, the ride quality is still smooth and pavement irregularities are absorbed without protest. The 2018 Camry is available with a 2.5-liter 4-cylinder engine which produces 203 horsepower and 184 lb-ft of torque or a 3.5-liter V6 which makes 301 hp and 267 lb-ft. Both are front-wheel drive and have 8-speed automatic transmissions. A 2.5-liter hybrid option is also available which produces 208 net hp and uses a unique 8-speed automatic/CVT transmission. All three engine options offer respectable acceleration allied with class-competitive fuel consumption figures. 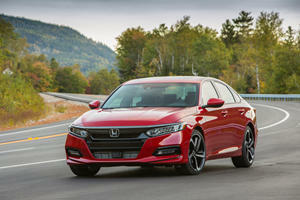 The 3.5-liter V6 in particular offering one of the highest outputs in the family sedan segment and performance to match, while the hybrid offers up to a claimed 51/53 city/highway consumption figure. 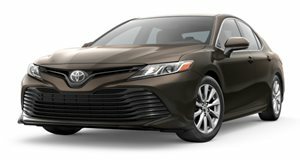 The 2018 Toyota Camry is available four basic trim levels. The LE trim is available with either the gas or hybrid 2.5-liter engines and offers a comprehensive specification level including power driver seat, Entune 3.0 Audio with navigation although no Apple CarPlay and Android Auto compatibility, wireless smartphone charging, Bluetooth connectivity and folding rear seats. Standard safety systems are excellent for the class and even the LE trim has frontal collision and lane departure alert, automatic high beams, adaptive cruise control and pedestrian detection as standard. Dual-zone climate control, heated front seats and one inch smaller 16-inch wheels are unique to the Hybrid LE. SE trim takes advantage of the improved driving dynamics and include sport suspension, sharper steering, paddle shifters and 18-inch wheels. Leather upholstery is also included. An SE Hybrid is also available and features very similar specifications as well as front seats that are heated. XLE Trim can be had in both 4-cylinder and V6 engine options and offers a 7-inch information display, LED headlights and taillights with fully integrated LED daytime running lights, wood interior trim and leather trimmed seats with heating for the front row. The XLE V6 adds a panoramic glass roof and dual exhaust while both the hybrid and V6 include a 10-inch head-up display unit. The top XSE trim is only available with the two gas powered engines and some of its additions include 19-inch wheels an acoustic noise-reducing windshield and on the V6 XSE, Safety Connect and a panoramic sunroof. 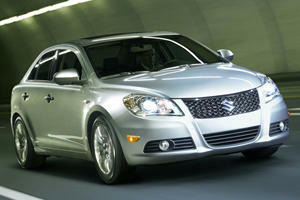 The 4-cylinder XSE also produces a touch more power at 206 hp and 186 lb-ft, thanks to the standard dual exhaust system. Individual items can be specified depending on trim level and the panoramic sunroof and various audio packages are also available. The redesigned 2018 Toyota Camry attempts to shed its dowdy image by offering more edgy styling, sharper driving dynamics and a range of powerful engines. The core attributes that made it so successful haven’t been ignored as it retains a spacious interior and comfortable ride. A comprehensive specification list and impressive safety devices make it hard to ignore in the competitive midsize family sedan sector.